The Education Department of AKTU has published the official notification as per which online applications are invited from the candidates seeking admissions in Dr. A.P.J. Abdul Kalam Technical University U.P. To be more precise, applications are being invited for admissions of candidates into B. Tech./B.Arch./B.Des./B.Pharm./BHMCT/BFAD/BFA/MBA/MBA (Integrated) /MCA/MCA (Integrated) & 2nd Year of B. Tech./B.Pharm./MCA courses. For this purpose, the University conducts an Entrance exam known as UPSEE (Uttar Pradesh State Entrance Examination). Online Application form are invited from 23rd January 2019 to 15th March 2019. As per the official notification, AKTU UPSEE Applications are being invited the UPSEE examination from 23rd Jan 2019 to 15th March 2019. All the important information regarding the UPSEE examination, Courses offered by the AKTU University as well as the admission procedure is being displayed here. However, before applying for the Entrance exam, candidates should check the required eligibility conditions for various courses that are being required for admissions in AKTU University. The UPSEE entrance 2019 Examination shall be held on 21-04-2019. The main thing is that this year 20 percent of the seats have been reserved for all the students of another states. For admissions in First year of Undergraduate or Post graduate integrated courses, the candidates must have passed the 10+2 level examinations scoring at least 45% marks from U.P. Board or any other equivalent Educational board. For admissions in First year of Post graduate, the candidates must have passed the graduation scoring at least 50% marks from a recognized University. For more information regarding the eligibility conditions, the candidates can visit the official Information Brochure of U.P. State Entrance exam, a link of which is given at the end of this article. Hereby all the information regarding the UPSEE entrance exam dates, exam scheme, the admission procedure and the counseling process/seat allotment has been described for our esteemed candidates. The eligible candidates will be issued Admit cards for UPSEE entrance exam 15 days before the commencement of exam. The candidate would have to download their admit cards from the official website of upsee.nic.in. The candidates have to provide the password and the registration number/roll number that was generated at the time of Online Application. A link will appear for the download of Admit card/ hall ticket. Every candidate have to download this admit card and take it with themselves at the exam center. It has been notified that the result of UPSEE Exam will be declared in the first week of June 2019. 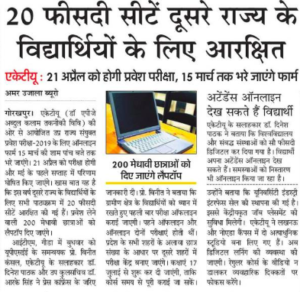 Based on the marks scored by candidates in UPSEE exam 2019 merit list will be created for admission of candidates’ in B. Tech./B.Arch./B.Des./B.Pharm./BHMCT/BFAD/BFA/MBA/MBA (Integrated) /MCA/MCA (Integrated) & 2nd Year of B. Tech./B.Pharm./MCA courses. Based on the ranks being obtained in the merit list, the candidates will be called for counseling Round/seat allotment. The result and counseling dates will be provided to the candidates through the official website of aktu.ac.in. As soon as the UPSEE exam results are being published by the A.P.J. Abdul Kalam Technical University, there counseling process will be started. It is being expected that the counseling/allotment of seats will take place tentatively in the month of June 2019. The counseling process will be hosted by Central Admission Board (CAB) and under this; the candidates will be called for verification of documents.